Annalisa Russell-Smith is an award-winning storyteller and producer of short films with experience in the UK and America. She's passionate about creating memorable digital content for your organisation whether it's for marketing, fundraising, creating awareness or recruiting the right kind of staff. A behind-the-scenes look at the making of this landmark exhibition about Hampshire's very own Jane Austen as it is being developed and built by Hampshire Cultural Trust. This film was installed as part of the exhibition marking the bicentennial of her death showcasing six portraits from private and public collections brought together for the very first time, works by artists including Grayson Perry, and Jane Austen at The BBC. Includes interviews with curators Kathryn Sutherland and Louise West, and exhibition designer and manager, Ioannis Ioannidis. The Making of The Mysterious Miss Austen Exhibition: Prop and costume maker, Claire Isbester, explains how the copies she is making of Jane Austen's silk pelisse, a type of light coat that actually belonged to the much-loved author, will be used in the landmark exhibition. The University of Winchester has its own record label, Splendid Fred Records, and this film is about an album of songs created to help raise awareness of climate change. It's also the 2017 Green Gown Award winner for Student Engagement. Chasing Perfection follows the restoration of a baby grand Steinway over the course of several months as Shawn Hoar works his magic to bring it back to life in his state-of-the-art workshop, Shawn's Pianos in West Hartford, Connecticut. As a Master Craftsman, Shawn is always chasing perfection as he restores these complex instruments from the beams up, uncovering the secrets of the original craftsmen as he works. We also get to see his beautiful showroom filled with pianos, vintage and new, for pianists, piano lovers and collectors of all levels. The film won a platinum in the 2016 AVA Digital International Awards and a gold Hermes award. So Much More Than Pudding: The Human Story Behind Meals-On-Wheels. Connecting with the people whose stories you are telling is so important. On the day of filming, Alice changed her mind about being interviewed. But actually, she decided to get her hair done so she'd be at her best to explain why Meals on Wheels are such an important part of her life. CW Resources, Inc., a national nonprofit based in New Britain, Connecticut, creates more than 2.5 million meals a year for delivery to seniors like Alice, whose only contact with the outside world on most days, is from the driver delivering her meal. A 2017 Gold Hermes award winner. — Sandie Lavoy, Sr. VP of Community Rehabilitation Services , CW Resources Inc., New Britain, Connecticut. This series of short films was made for CW Resources, Inc. a national nonprofit, to take to Washington DC as a lobbying tool to raise awareness among legislators of the 14(c) Special Minimum Wage Certificate, a provision under the Fair Labor Standards Act that has been up for repeal, which allows those with significant disabilities to work and earn at their own pace. It's a contentious subject because it raises questions about some basic human rights. The brief was to put a human face on a difficult issue and to create a deeper understanding overall by telling some very personal stories alongside the story of the organization. A 2017 AVA Digital Gold award winner. Community Mental Health Affiliates (CMHA) wanted to showcase the importance of their comprehensive behavioral health and addiction services to legislators, potential employees and to funders through the eyes of their clients and employees, to show the longterm value and effectiveness of their work helping people from all walks of life. The Spirit of Caring is a series of short films I wrote and created about people who have worked hard to overcome some of life's most complex problems with the help of CMHA. The campaign won highest honors, a platinum at the 2016 Hermes International Awards and a gold in the International AVA Digital awards." Lieutenant Virgil Decker of the Waterbury National Guard presenting the flag at the burial service of Henry "Sarge" J. Raymond Jr., 85, of Terryville, to his daughter Pat Raymond of Bristol. The funeral service and burial took place Tuesday with full military honors at St. Joseph's Church and cemetery in Bristol. At right with her mother is Gabby Raymond. United in prayer at a vigil for hope and against violence on North Street, New Britain Sunday afternoon, Tina Sweeney of New Britain, left, comforts Barbara Playa, the mother of teenager Jackson DeJesus who died on North Street after a hit-and-run. Five small boys quietly watch as their firefighter fathers, some who volunteered in New York City after the Twin Towers came down in the 9/11 attack, stand at attention during the Bristol Fire Department 9/11 tenth anniversary memorial on North Main St. Bristol, Connecticut. From left to right, Drew Martineau, age 2, Brandon, Jude and Tyler Lavoie ages 5, 3 and 6 respectively, and Noah Dufour, age 7. Helen, a young pit bull mix rescued after a life in the underground world of dog fighting, with her new owner, therapist Warren Corson III aka "Doc Warren" who has given her a new life as a therapy dog at his office in Bristol, Connecticut. Michael Karabin of Karabin Farms in Southington explains how they make maple syrup to four local girls at his modern sugar shack. "It takes roughly 40 gallons of sugar maple sap to make one gallon of syrup" he explains. From left, Alyssa Beharry, 8, of New Britain, Gloriah Mills, 10, of Bristol, Ashlynn Beharry, 5 of New Britain, and Evalynn Beharry, 5 of Plainville. The Reverend Al Sharpton spent Mother's Day at McCullough Temple in New Britain Sunday, holding an enraptured congregation for an hour with down-to-earth advice, "You go to church on Sunday to get energized like going to a gas station so you can go and do good things for the rest of the week." In the background from left, local minister Chivas Grant, Reverend Thomas Mills and Pastor Jenks. Basketball coach Ryan Martin, left, who plays pro-basketball in Spain, being blocked by Rachael Grusse, 21, of Glastonbury at the Hospital for Special Care Ivan Lendl Adaptive Sports Camp held at the University of St. Joseph in West Hartford. New Britain Firefighters Randy Smith, Sean Crawford, Chris Choipaski and Lieutenant Andrew Coppa cut their way through the roof of a building on Washington Street in downtown New Britain during a real-life training exercise on Saturday. The triangular holes take less time to cut enabling crews to alleviate heat quickly to facillitate the rescue of occupants. Twelve-year-old violin soloist Kenta Nomura of New York takes the stage at Welte Hall in New Britain for his performance of Tchaikovsky's violin concerto, movement 1, with Maestro Adrian Sylveen conducting the New Britain Symphony Sunday afternoon. Treacherous conditions and "thundersnow" a strange and unusual phenomenon producing lightning and thunder in a snowstorm hit most of Connecticut on Saturday evening, October 29th. Downed trees and power lines add insult to injury for all those trying to get to Halloween parties. 800,000 are without power and thousands of trees that still have their leaves are badly damaged and cannot bear the weight of the snow. Ex-marine Ron Eldred of Terryville, Connecticut, surveys an enormous downed oak estimated to be 200 years old, which totally blocking Jacob Street near Rockwell Park in Bristol on Sunday morning, October 30th. An early snowstorm the night before knocked out power to a large portion of the city and state, downing trees still in leaf and power lines that could not bear the weight of the wet snow. Doris Wujcik, a resident of the Jerome Home in New Britain cuddling Eddie, a therapy kitty who belongs to Terri Jennings of Waterbury, in background. "I rescued Eddie" explains Jennings, "and he clearly loves his job, though I'm not sure who really rescued who." "No doll should ever go in the garbage” says Renee Silvester, owner of Calling All Dolls, who restored a badly dilapidated house in Cobalt, Connecticut, to house her doll collection, store and doll hospital. She spends countless hours working in the doll hospital, a quiet room at the back of the store with a door opening to the garden. The dolls wait here to be restored, set up in antique beds. "Some have been waiting for a long time" she explains ruefully, "but I get to them all". New Britain firefighter Christopher Choinski makes his retreat at 132 Oak Street in New Britain late Thursday morning where fire had broken out. The cause is under investigation. 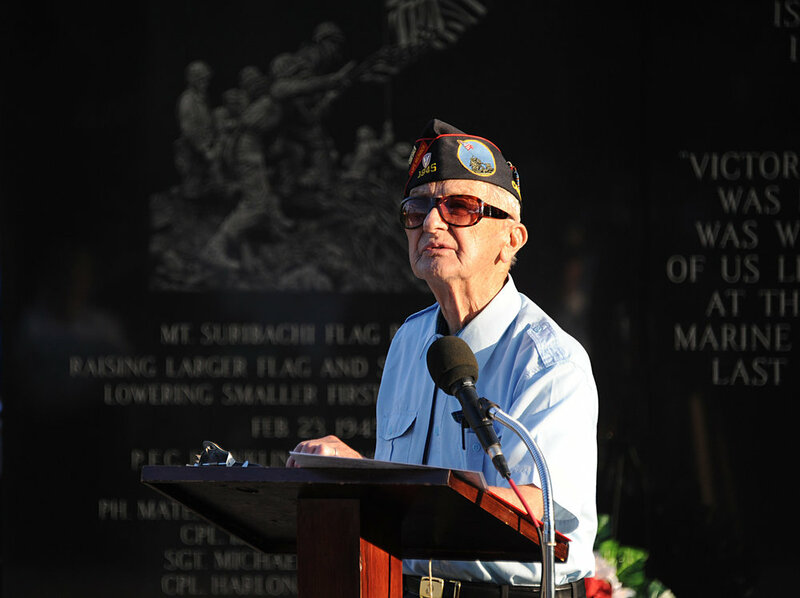 World War II veteran Sam Vasellina of New Britain at the Iwo Jima Memorial Historical Foundation 4th Annual Flag Day Open House Sunday at the National Iwo Jima Memorial on the New Britain/Newington town line, with his wife Betty standing behind at right and her sister Gladys Young who is visiting from Scotland. New Citizen Celebration, July 4th. 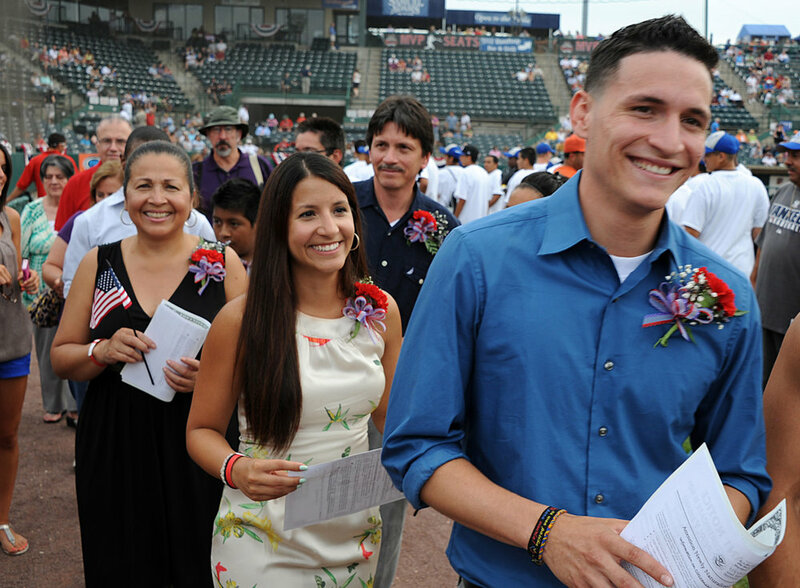 New Citizen Celebration, July 4th The Duque family of New Britain, proud new citizens of the United States after being sworn in Tuesday in a ceremony at the New Britain Stadium before the Rock Cats baseball game. From left, mom Martha Andrade, Monica, 22, father Jaime, and Juan, 20. The family is originally from Columbia. Vance Elementary School staff among 150 teachers being trained on new iPad software for administering reading tests Thursday at New Britain High School auditorium. From left front, Denise Raap, reading resource teacher, Eileen Sliwinski, literary coach, from left rear, Michele Kushman and Kim Gambee, both grade 1 teachers. 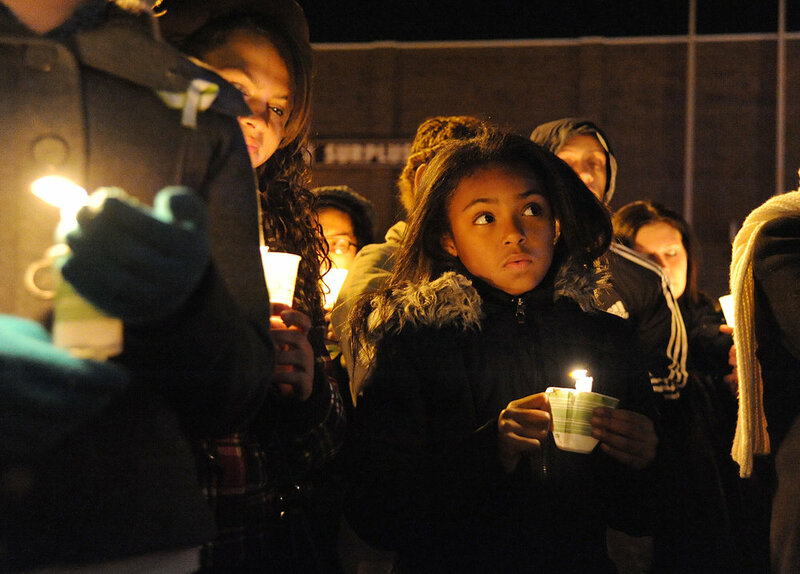 Nine-year-old Kaylie Lee, right, of New Britain, holds a candle at the city's vigil held in Central Park for the victims of yesterday's shooting at Sandy Hook Elementary School where 20-year-old Adam Lanza fatally shot 20 children between six and seven years old, and six adult staff members. At left is her sister Karyann Aleverio, 16. Best friends Deanna DelMonaco, 17, left, of East Haven and Vanessa Jamieson, 16, of Milford with stylist Tina Gunther at the Cadillac Ranch in Southington Sunday raising money for St. Baldrick's Foundation, the largest private funder of research and assistance to kids who are fighting cancer. Deanna is fighting the disease for the third time since 2009, so Vanessa pledged to support her by having her auburn locks buzzed off. "I was a bit nervous about it at first, but I'm okay now!" she said. Jeanette Cyr of Berlin, 78, left, congratulates fellow runner Geoffrey Etherington of Killingworth, 80, at the Fifth Annual GE Road Race in Plainville, Connecticut, to benefit the Petit Family Foundation. Both runners placed in the top three in their age categories. Reluctant to give their names, but wanting to tell their stories all the same, Susan, at right, explains that her family back home don't know that she is homeless as her friend does her hair and make-up for a photo to load onto FaceBook at the shelter. "I know it's hard to believe, but I have a good education, my father is a doctor, circumstances are tough sometimes." Annalisa is an adventurous soul who loves nature and whose curiosity has led her to explore and travel all her life. She's passionate about storytelling as a way to connect with people, recognising that throughout the ages, people have relied upon stories to keep their cultures strong. Her passion for motorbikes led to the exploration of obscure country lanes all over the British Isles where she grew up. Later, she learned to fly hang gliders before deciding she'd be better off with an engine and started exploring the countryside from the air in an old Cessna. In her twenties, she gave up her job as a product manager and designer to go around the world for a year -- something she'd dreamed about since she was small. Some people thought she was crazy to sell her house and give up her glamorous job to go off on her own. "Where will you sleep?" they asked. It was a good question, because there weren't all the online resources for finding places. Others thought she was brave and wished they could do the same. She set off first to Africa armed with her camera and a small backpack, travelling on a shoestring around Kenya, Tanzania and Zanzibar, Zambia, Botswana, Zimbabwe, South Africa and Namibia. Then to Hong Kong, which was still under British rule and on across China by train. Australia was next, then New Zealand, the Pacific Islands, America and Canada. "It's the best thing I've ever done, the kind of adventure that builds self reliance and character, I see that now." In 2007 while living in America, her best friend roped her into volunteering to start a farmers' market. As a self-confessed food snob, it didn't take long before she was very involved in the local food scene and helping to run a small farm that she got certified organic. People loved her beautiful produce and learning how to use and cook with seasonal ingredients in the recipes she developed. Making some of those recipes live on a few local TV shows brought more people to the market and cemented her love for real food, and the local food movement. It was at this time while working in her full-time job as a photojournalist that she fell in love with video and founded Local Planet Productions in 2009, to help organizations use storytelling to create a better understanding of their mission or services. She's learned her craft from mentors and some of the best documentarians in the USA through the National Press Photographers Association (NPPA) professional development workshops held at the University of Syracuse, New York and the University of Oklahoma Gaylord College. She loves learning and improving her skills, and helping others improve theirs. While serving as the NPPA's Regional Chair for New England, she developed a training workshop for visual journalists held at the The Boston Globe headquarters in 2016. Annalisa is in demand for her ability to develop and deliver projects from the ground up with style and attention to detail. She is constantly thinking how to shape ideas into fresh and visually creative forms. She is a multi-skilled self-shooting Producer/Director who is adept at obtaining access to sensitive contributors and fostering relationships for the duration of the shoot and beyond. Her interviewing style is relaxed and informal, putting the subject at ease in front of the camera whilst gathering the best material possible. With experience in all aspects of story development from concept and copywriting to on-site shoot management and post production edit, she also collaborates with other production houses including Trigger Air and Brand Filmworks on projects. "What I love the most, is being able to put a human face on some very complex issues. The best compliment I can receive is "She gets us!" because then I've really done my job." A native of the British Isles, Annalisa is available for assignments anywhere in the world.